I’m trying to psychologically prepare for the pain of my crossfit session tonight (after a few days rest), but I’m still dreading it so thought I’d “escape” for a while and write you an email. Here’s a shot that contains two of my favourite things. 1. The challenge of shooting directly into the sun. Sometimes the weather conditions can help make the first one a little easier, like in this shot where the sea mist created a haze that softened the harsh sunlight. I could have needed upwards of 4 or 5 exposures, 2 stops apart, if it weren’t for the haziness. But believe it or not I only needed 2 this time. The dark exposure for the sky was at 1/13th of a second and the other was 0.3 seconds, which I find to be a great shutter speed for capturing moving water up close. It is long enough to capture the sense of movement, whilst short enough that it retains lots of nice detail. It took quite a few attempts at capturing that wave just right. I count 15 attempts in Lightroom right now, not including the ones I deleted. When trying to time a wave like this, I’m in manual mode on my camera not worrying about multiple exposures. Then once I get a shot where the wave looks good, I’ll quickly turn the dial to adjust the shutter speed up or down to capture the rest of the exposures I need. This way, I get the required bracketed exposures as close together as possible which makes them easier to blend (especially if the clouds are moving between shots). 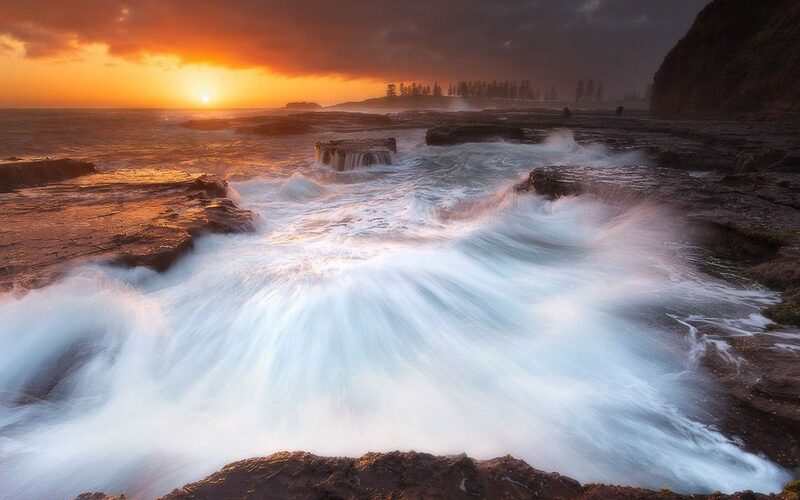 This is opposed to shooting in auto-bracket mode which takes all three or five exposures close together every time, but you end up with heaps of wasted shots, and it’s harder to time the perfect wave if it comes along when you’re camera’s still taking other exposures. I allowed myself a little creative license when processing this shot too, really bringing the attention to the wave in the middle by darkening the rocks and pushing the whites of the wave to their brightest limits. But as I’ve been talking about recently, I like processing my shots how I remember seeing them and how they made me feel when I took them – not necessarily like true-to-life documentary captures. The technical side of processing this shot was a clinic in luminosity masking. Being able to blend and adjust the water separately from the sky, separately from the rocks and distant trees, separating them all based on their brightness was critical. 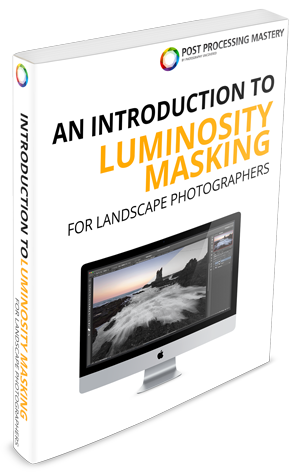 If you’d like to learn these techniques yourself, I lay them all out in my luminosity masking video course.